Please note that this thread is dedicated to BuClean Studio and its issues. Any bugs and downloads must be placed here, also you may copy some information and do a link to this thread. We are working on a Silent Installation Toolkit which will help the user to silent install a bunch of softwares simply. An updated version of BuClean will include the ability to quick SlipStream Win7, a new Windows Editions Display, MegaConverter (perviously know as Exe2Cab Converter, added features to convert between all pictures formats and MSU to Cab), ISO Builder and USB Burning, Soon will be released. We have released the Version 5 Enterprise, Please refer to the ChangeLog for more information about this release. An updated version of BuClean holding the name "BuClean 5 Enterprise Optimized" will be released in the next two days as We expect. This edition will add the full support for any language, this has idea has been improved and studied after a Russian group called "Megasoftware GrouP" has PM'ed us about translating the software. Also the edition will support the Tab key to move around more accurately around the controls, and an optimized performance and look for all BuClean Applications. In Addition to that we have re-written the messaging classes to support any language included a class for translating and rendering the messages. 1. Renaming BuClean 7mizer and 7Customizer to BuClean 7Customizer. 2. Developer will lead the MENA Team of BuClean. 3. Developer will be the first BuClean member to implement a real Component Removal. 4. All XMLs and Standards that were created for 7Customizer will be supported officially on BuClean 7Customizer. 5. Both old softwares (7Customizer and BuClean 7mizer) will no longer be supported. However the latest software will be supported under the name BuClean 7Customizer. 6. BuClean MENA Team, Will provide the second language support for BuClean. 7. Developer will have the lead of BuClean 7Customizer and its standreds. 8. BuClean Main Windows, Will be changed for that reasons with some information and designs illustrating the unity between 7Customizer and BuClean. 9. BuClean 7Customizer will be one software, Supporting Windows Vista and 7. and soon Windows 8. This agreement will help both 7Customizer and BuClean to provide better services under one single team named "BuClean 7Customizer". The Russian team which is dedicated to translating the software to Russian, has informed us that they are facing a trouble, and it must be solved by the end of this month. That is in addition to the first version which will graduate from the beta to the normal phase. After contracting with 7Customizer developer. Also the name of the software will change from 7mizer to BuClean 7Customzier. We have released the Version 5 Enterprise Optimized, which supports the Multilingual, Remove Components, 7Customizer xmls and much more. Please refer to the ChangeLog for more information about this release. We have fixed a bug that prevents the updates from being recognized also the WAIK problem has been fixed you will only need to point the address manually. It is a tool base on C Sharp OOP coding and using WAIK to help it on some key tech features when dealing with the Windows 7 edition. BuClean Studio is developed with beginners in mind as well as professionals, it could deploy Windows edition in a matter of minutes with needed configuration. In other words it will help you to cook your own Windows 7 with your favorite spices. Integrations: Fonts, Cursors, Languages (both install.wim and boot.wim), Hot-fixes, Drivers, Themes (You can choose default one), Wallpapers (You can choose default), Packages(Both Install.wim and boot.wim), User Accounts Pictures (You can choose User and Guest default pictures). Screen Savers, Applications with switches (for silent installation), Registry Tweaks, OEMLogonBackground. Customizations and Tweaks: There is a feature which lets the user to choose pre-settings for the Windows Explorer, TaskBar, StartMenu, System and Services. Next to that there the ability to change, edit, or replace Windows Files with ResHack or MsPaint as default resource editors. DVD/USB Burning, ISO Creation, In Addition to Image splitting. Windows AIO Builder: lets the user to build a Windows DVD/USB with about 30 different editions of Windows in just one USB/(2DVD). Make a Windows PE/RE with-out WAIK? You could integrate packages and languages for both the Windows Setup and Windows Shell (boot.wim and install.wim) respectively. The Studio in its architecture of BuClean is built with multilingual in mind and we are looking forward for contributes to make BuClean translated to other languages. However the 32-bit can work on 64bit computers with-out any problems. Bugs normally will be fixed after 2 working days of date of reporting. Bugs should be sent to the Leader of the Team On email or on this thread. 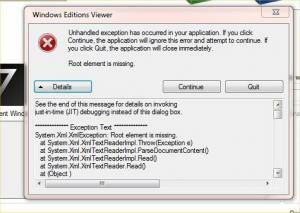 Note: You must provide a descriptive notes about the error or attach a snapshot and log file. Please also take in mind removing the product key and any personal information from unattend.xml. Does BuClean supports Windows XP? Do I need to search for Dism.exe? Will you think about giving up Imagex.exe? Yes, We are really contacting some people to give us an advice about how to use the APIs of Imagex in a fast way. Because Imagex.exe is faster than its APIs We have tested that. Fixed the Windows AIK problem with the Windows 64Bit, To support both AI64 and AMD64. Fixed the Windows AIK problem with all version including Franch. Thanks to myselfidem for the log and screen-shot. Fixed the Windows AIK problem. Fixed the Net problem for all Locales. Fixed the 7mizer ImageX problem. METRO COMPONENTS LIB (WRITTEN) "MESSAGEBOXES, FORMS, TOPFORMS, BUTTONS, BANNERS"
For Open-Source Issue: Please write us a PrivateMessage considering why BuClean must be Open-Sourced software. Please note that we are now disscusing this issue and resoultion will be made after we recieve your feedbacks. Thank you very much. Could you please attach a screenshot. Now it has been fixed and you can redownload it. first thanx for greating this tool. Ekttob you are the author? I have the same problem .. i have try to find the Windows AIK .. but it say it isnt correct .. i tried with my native language there is Danish .. and uninstall it and try the english version. After that i try search manually after the Imagex end the osc file .. and both this it says Wrong file ..
We are really sorry for been late to reply on your comments. Thanks for all of you, who had reported the bugs and we are pleased to inform you that we have fixed them. Please feel free to download them from here. Yes, I'm the Team Leader. Tested today: imagex.exe and oscdimg.exe paths aren't recognized with WAIK for Windows 7 installed on my computer! And I can't set the paths even if I select inside the dialog box! Note: For all users who are using the software please always attach LogFile (you can find it at C:\) and ScreenShot, So that we can indentify the bug quickly and more accurately. Just like Svend Rugaard a big thank to him. I have sent you a PM containing the links for same version (MSFN 7/11/11). Please check it and do not publish it. Note: It is the same version that is provided on this thread, But it will became old and not support so please do not publish the link.